A view of the Bi-State Vietnam Gold Star Twin Bridges that U.S. 41 uses to span the Ohio River into Henderson County, Kentucky. 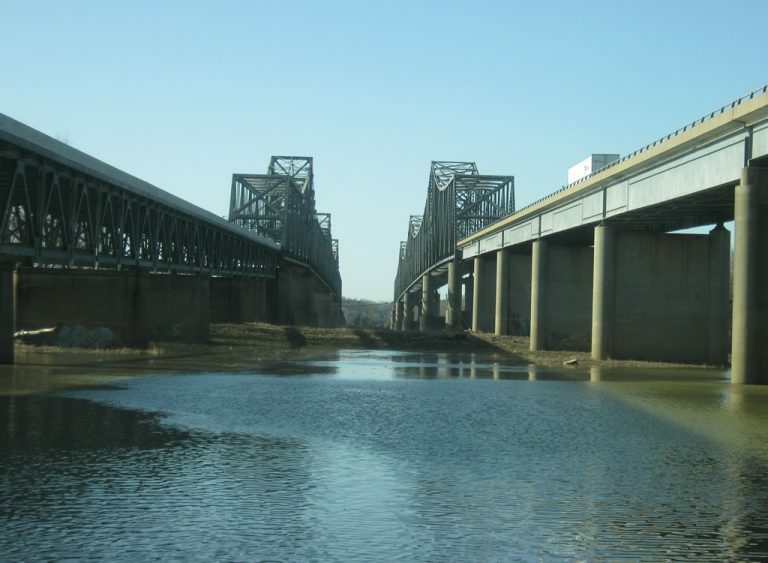 The twin bridges, typically called the "twin bridges" by locals, were built in 1932 (northbound span) and 1966 (southbound span) and connect the larger Evansville area with Henderson to the south. Among the crossings between Indiana and Kentucky, these are the only bridges that cross the Ohio River solely in Kentucky. A new bridge for Interstate 69 will be built to the east of these bridges to provide a second crossing between the two communities. However there is no timetable for the construction of the new (and presumably toll) bridge. Photo taken by Thomas Decker (03/06/12). U.S. 41 travels for 280 miles along the western border of Indiana from the Northwest Indiana suburbs of Chicago south to Indiana's third largest city of Evansville. Nationally, U.S. 41 goes for 2,000 miles from Copper Harbor, Michigan to Miami, Florida. At one time the U.S. 41 corridor was planned as the north-south toll road for Indiana to complement the east-west toll road up north. Although it is not a toll road, it is still a major highway for most of its routing, with Indiana 63 filling in the gap for the sections that aren't four-lanes. U.S. 41 was twinned through the years beginning in the 1960s across western Indiana, and with the exception of the stretch from Terre Haute to Attica, is a four-lane highway across the state. Along with the Indiana 63 expressway in Vigo, Vermillion and Warren Counties, the highway is among the most important non-interstate routes in Indiana, providing a long-haul route from Chicago to Evansville and points south. Due to a shift in the Ohio River's path, U.S. 41 enters Indiana north of the river and enters the Evansville area as a busy highway. From Evansville, U.S. 41 continues north past the communities of Princeton, Vincennes and Sullivan as a part of a major highway between Evansville and Terre Haute. North of Terre Haute, U.S. 41 becomes a two-lane highway that travels through Rockville and Attica while Indiana 63 serves as the primary four-lane expressway to the west. North of Attica, U.S. 41 meets up with Indiana 63 and continues as a four-lane highway across the flat farmlands of Northwest Indiana. Finally, the highway enters the urbanized part of Northwest Indiana in the communities of St. John, Schererville, Highland and Hammond before exiting the state at the border with Chicago, Illinois. A view of the U.S. 41 control cities of Terre Haute and Evansville at the Hart Street interchange in Vincennes. Photo taken 11/06/10. From the Hart Street interchange in Vincennes, Terre Haute is 58 miles to the north along U.S. 41. Photo taken 11/06/10. From the Hart Street interchange in Vincennes, Evansville is 53 miles to the south along U.S. 41. Photo taken 11/06/10. Heading east along Indiana 64 & Indiana 65 on the west side of Princeton. The cities of Vincennes and Evansville are the control cities for U.S. 41. Photo taken 11/13/10. At the same cloverleaf interchange, a guide sign now indicates Terre Haute as the control city of U.S. 41 north. Throughout the Princeton area, Vincennes and Terre Haute are used interchangeably as controls heading north, Evansville however is always the control city heading south. Photo taken 11/13/10. A view of U.S. 41, Indiana 62 and Indiana 66 shields at the intersection of U.S. 41 & Indiana 66 and Morgan Avenue (Indiana 62) in Evansville. The three highways are multiplexed for a stretch in between the Lloyd Expressway and Morgan Avenue. Photo taken 11/13/10. Vincennes and Evansville are the control cities here at the Main Street/County Road 300 South interchange south of Princeton along U.S. 41. Photo taken 03/06/12. A sign directs motorists to the north off of Main Street onto U.S. 41 north toward Vincennes to the south of Princeton. This interchange, along with the one at County Road 550 South, was constructed when the Toyota plant was built and both use Vincennes as control cities. Photo taken 03/06/12. Highway shields for U.S. 41 and U.S. 150 along their multiplex through Sullivan County. The two highways share the same four-lane expressway from Vincennes north to Terre Haute. Photo taken 10/10/09. A Business U.S. 41 shield along 6th Street in Vincennes. The business designation is merely a local designation as INDOT does not maintain business routes. In any respect, the U.S. 41 business designation is hardly used in Vincennes anyway. Photo taken 03/06/12. Looking east along Ohio Street (U.S. 150) in Downtown Terre Haute approaching 3rd Street (U.S. 41). The upcoming sign assembly signifies all the highways that used to run through Terre Haute. U.S. 40 used to follow Ohio Street east toward Wabash Avenue across Terre Haute, while Indiana 63 used to run concurrent with U.S. 41 & U.S. 150 across Terre Haute along 3rd Street. In the present day, Indiana 63 was decommissioned town and U.S. 40 rerouted to Interstate 70. Only U.S. 41 & 150 remains on this sign assembly. Photo taken 05/21/08. U.S. 41 and Indiana 10 highway shields in Lake Village in northern Newton County. Photo taken 05/21/08. Shields for U.S. 24, 41 & 52 at their intersection in Kentland in Newton County. U.S. 24 crosses U.S. 41 at a major crossroads near town while U.S. 52 comes in from the west along U.S. 24 and departs to the south along U.S. 41. Photo taken 12/29/11.